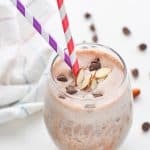 This Chocolate Almond Protein Smoothie is an easy breakfast recipe that's ready in just 5 minutes! 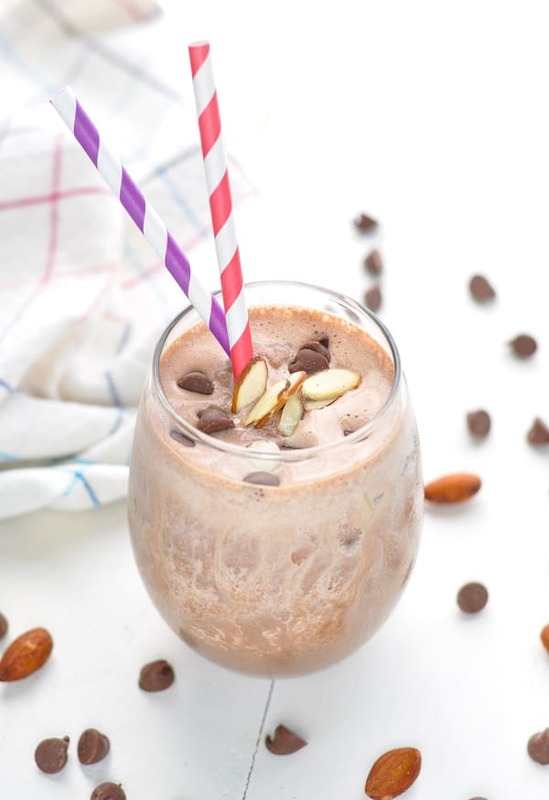 It tastes just like a thick, creamy milkshake, but this Chocolate Almond Protein Smoothie is a quick and easy breakfast or snack that’s loaded with lean protein and healthy fats to fuel your busiest days. 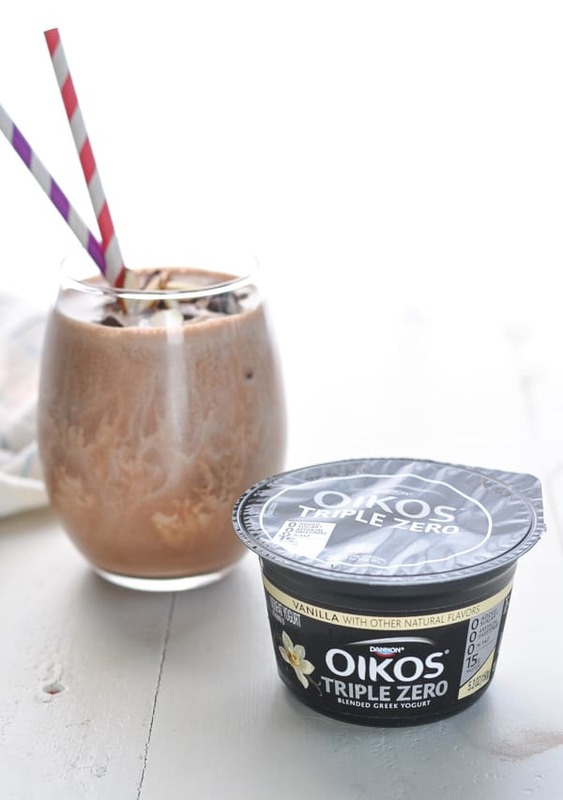 That’s right — you can have chocolate for breakfast! 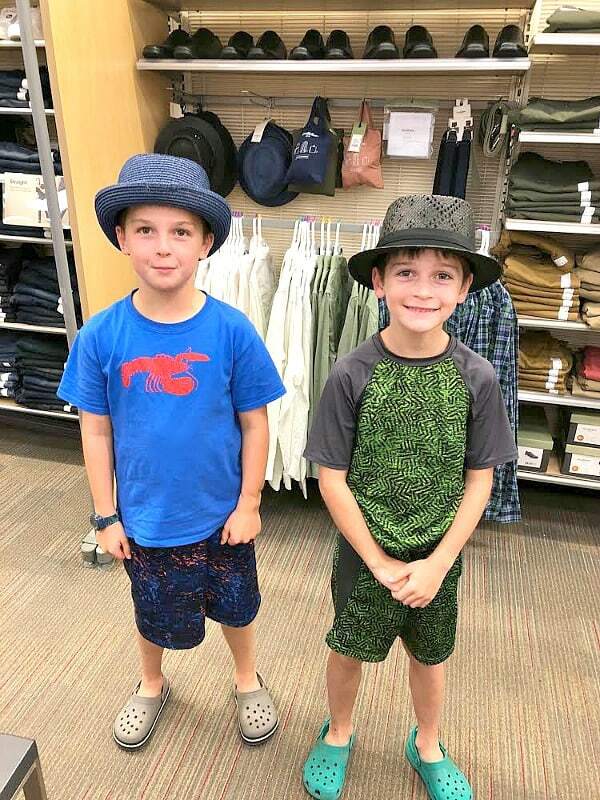 You guys…my kids went BACK TO SCHOOL this week! This is huge for me, because it’s the first time since I had kids almost 9 years ago that I have a quiet house 5 mornings per week! I miss my little sidekick, but Spence has started the morning pre-K program and is off to the “big” school with his brothers. That means that even though I have a few hours of “free time” each day, our mornings have become busier than ever. 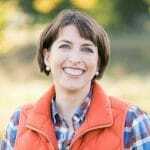 When our family ventured out to do our back-to-school shopping at Target last weekend, I was sure to grab not only the school supplies called for on each child’s list, but also some basic grocery staples that I knew would help me streamline breakfasts and lunches throughout the week. 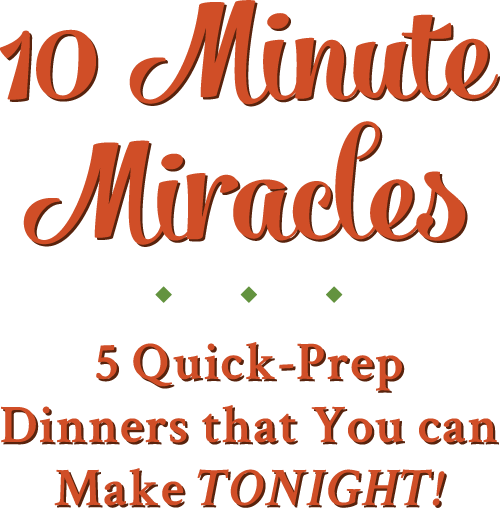 I need all of the help that I can get, and a quick 5-minute breakfast that satisfies and nourishes my family is at the top of my list! 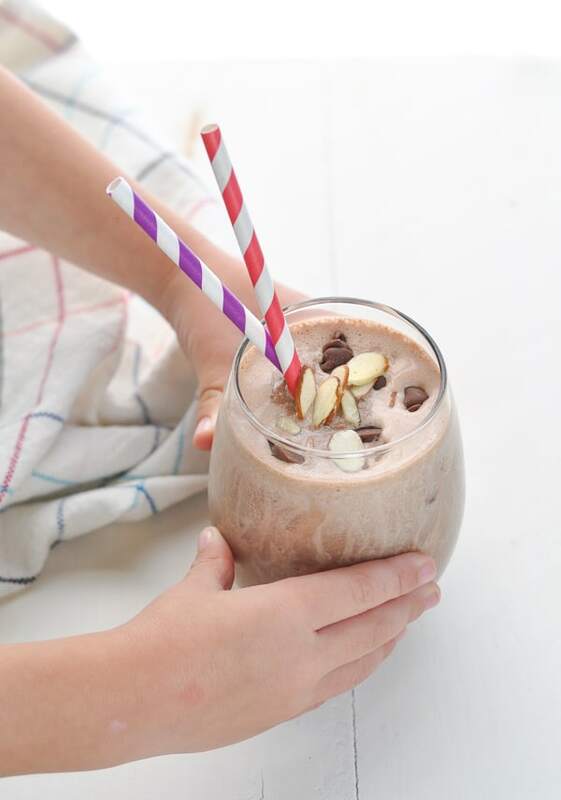 Spencer and I made our way through the grocery aisles to grab the kids’ favorite Danimals yogurt smoothies, as well as the ingredients that I always have on hand to whip up our favorite Chocolate Almond Protein Smoothies. 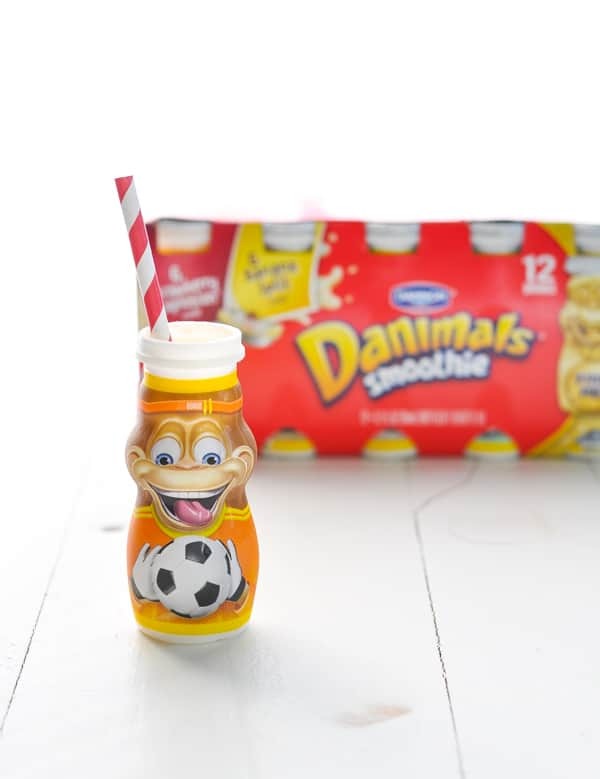 The Danimals are great packable options for school lunchboxes, and they are also convenient after school snacks that the kids can grab on their own. 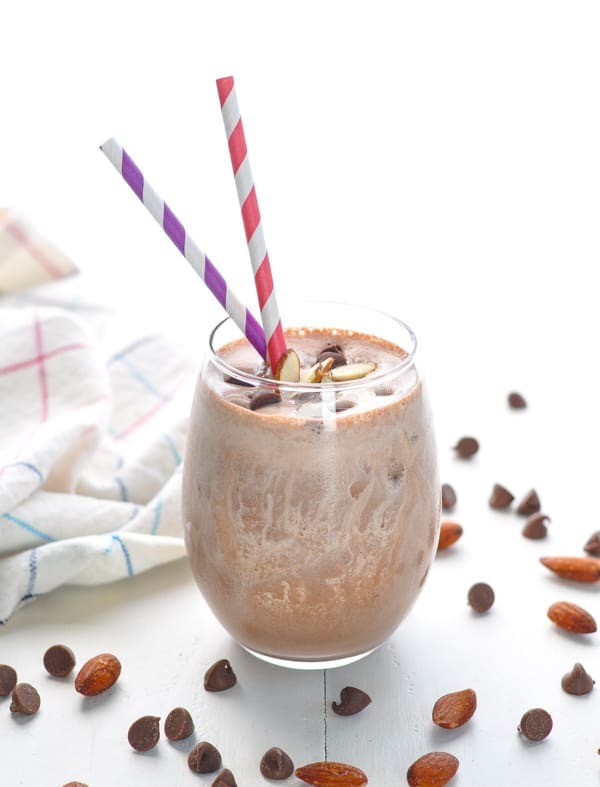 But when I’m preparing a breakfast at home before we rush out the door, this particular chocolate smoothie recipe is one of my go-to ways to start the day. I’m not kidding you when I say that it tastes like dessert! 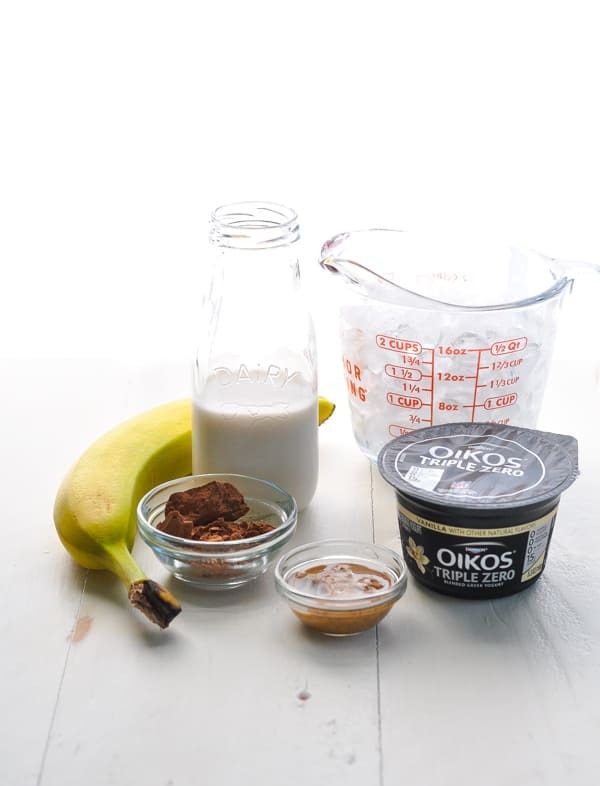 Thanks to the addition of creamy, thick Greek yogurt and satisfying almond butter, the smoothie stays with me for hours…so that I’m not reaching for a donut by 10:00 a.m.! 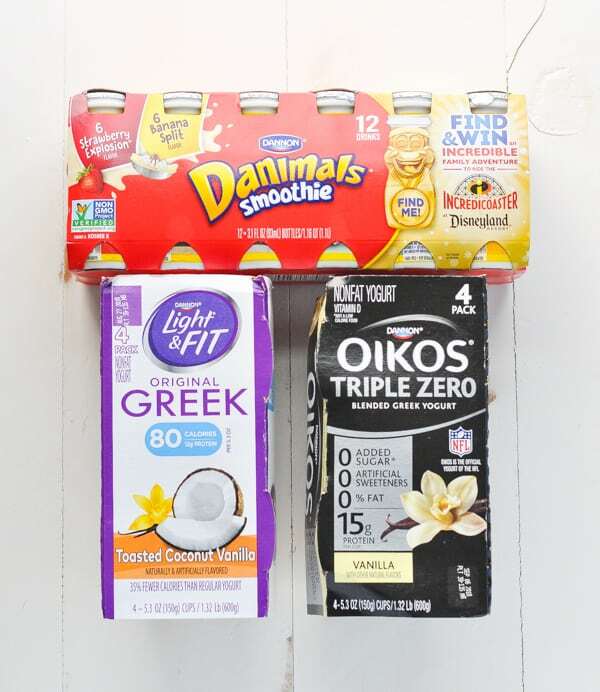 First of all, it’s important to note that you can buy everything that you need for this smoothie at Target (including the glasses and straws that you see in the photos)! I love one-stop shopping, so I obviously appreciate that I can buy food, school supplies, and clothing…all in one place! 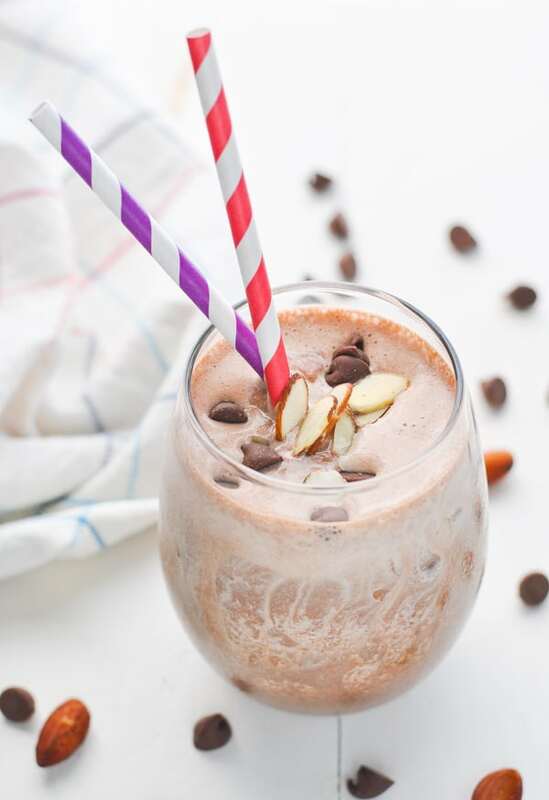 You’ll need: a banana (sliced and then frozen), almond milk (or other milk of choice), ice, cocoa powder, almond butter, almond extract, salt, and Greek yogurt. 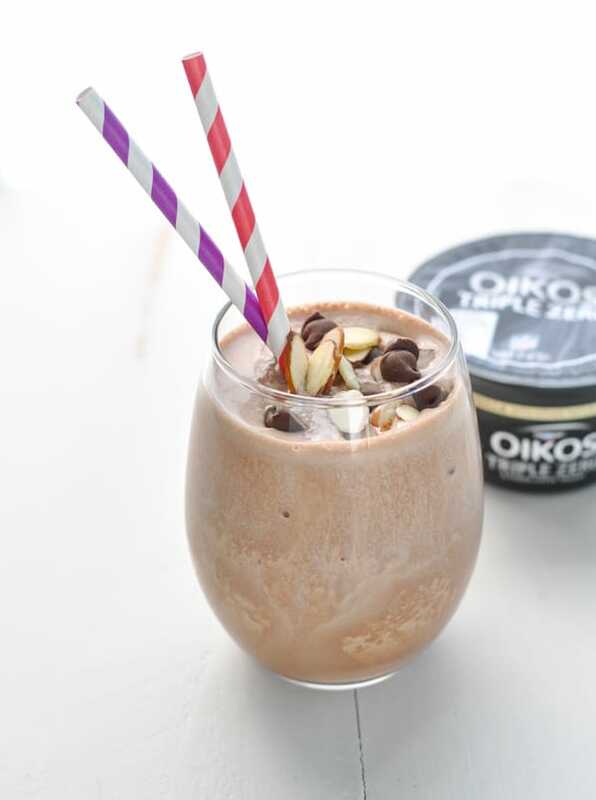 A scoop of chocolate protein powder is optional, but certainly not necessary! 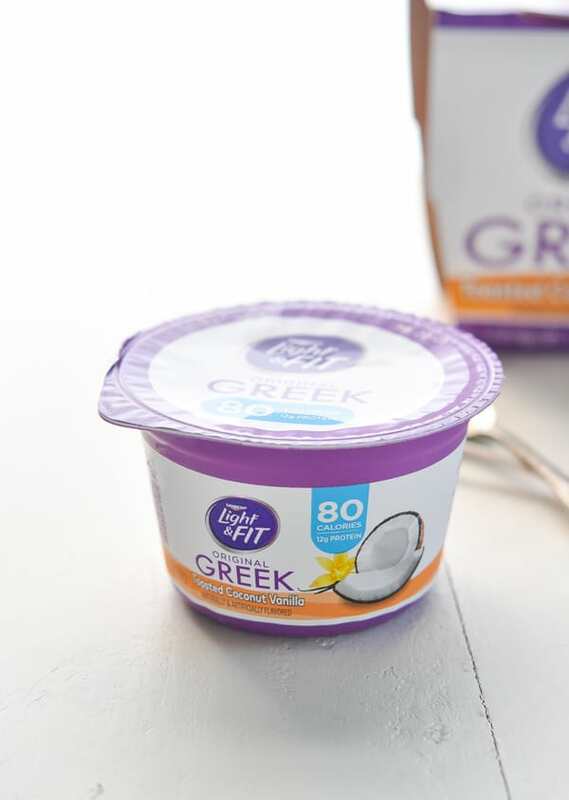 or the Light & Fit Toasted Coconut Vanilla Greek yogurt, which has 12 grams of protein and just 80 calories. 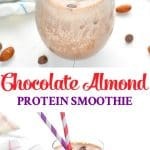 That added coconut flavor makes the smoothie taste like my favorite chocolate-almond-coconut candy bar! 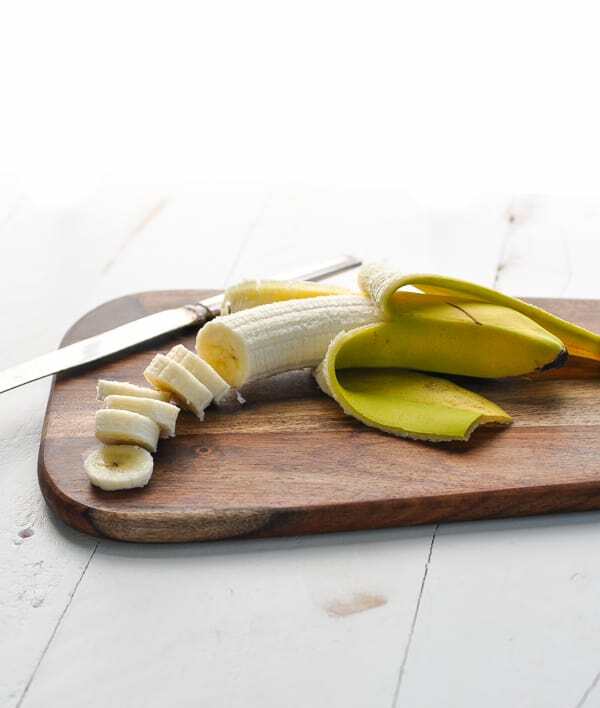 One of my favorite tips for creating a thick and creamy smoothie is to slice and freeze your banana the night before. 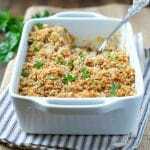 This is a great way to use up any overripe bananas that you have sitting on the counter, too. I have an ongoing stash in my freezer and I’m always adding to it! 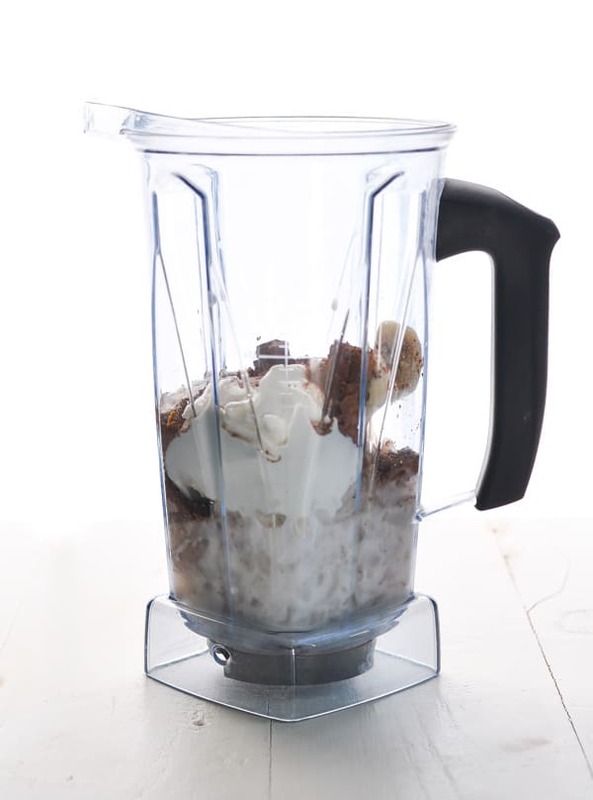 Toss all of the ingredients in a high-speed blender and puree until smooth! 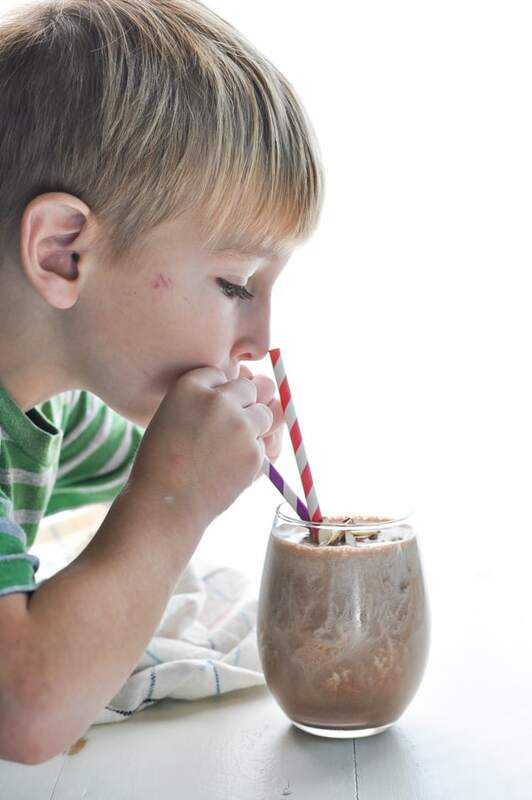 It’s milkshake (or protein smoothie) time! 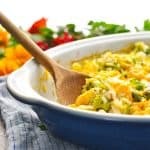 This easy, 5-minute breakfast is one that the kids can enjoy as well. It makes me feel good to know that they’re waking up to a meal that will keep them energized and satisfied as they tackle a new school year. 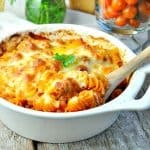 Plus, it’s a quick option that doesn’t slow us down on those mornings when we’re rushing to get out of the house. 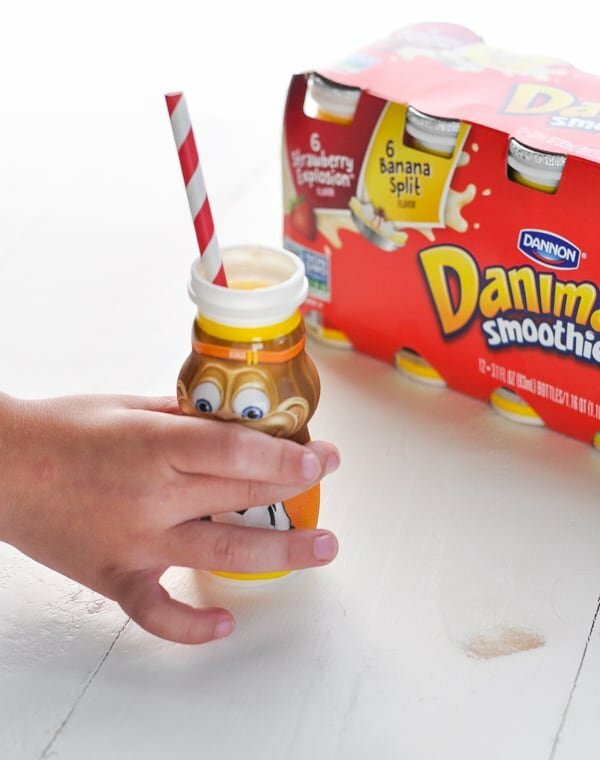 and I can toss a Danimals smoothie in their lunchboxes for later. The sweet addition to their mid-day meal is also a good source of calcium and free of artificial colors. 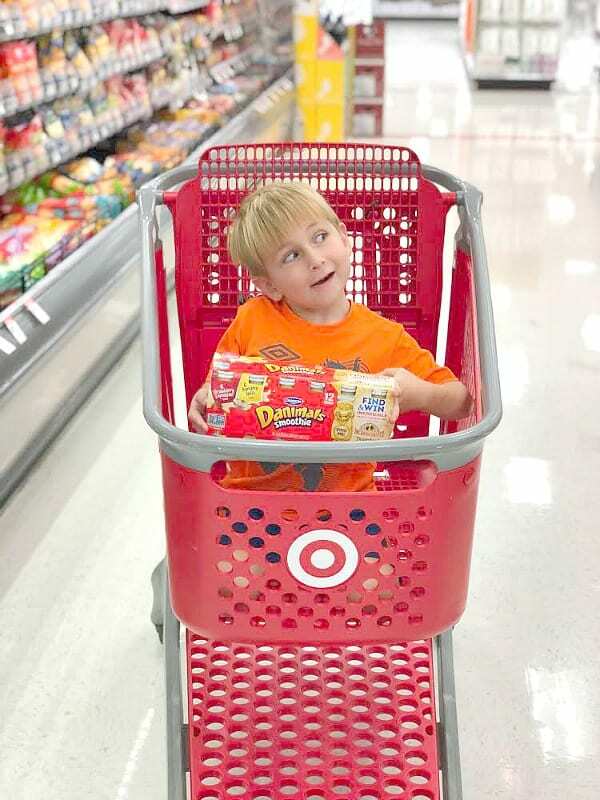 If you have a house full of yogurt lovers too, and if you’re in the midst of adjusting to the back-to-school routine, then you should definitely download and use the Target app to save on select yogurts with Cartwheel (between August 5 and September 1). 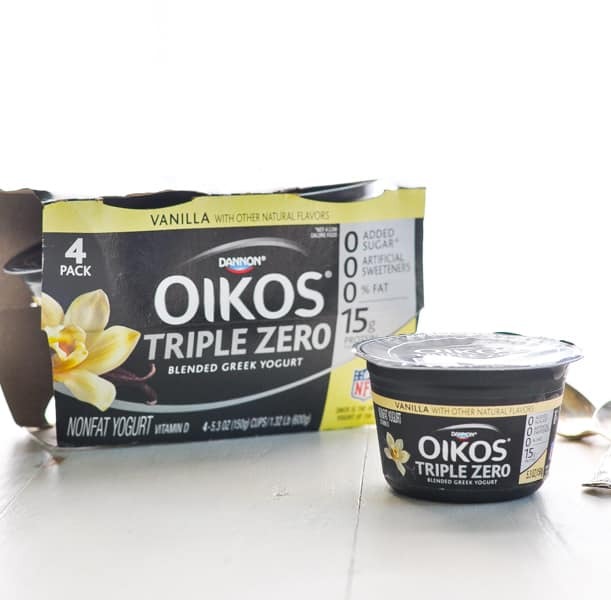 The discounted yogurts include: Activia, Oikos, Danimals, Light & Fit, and Happy Family Organics! 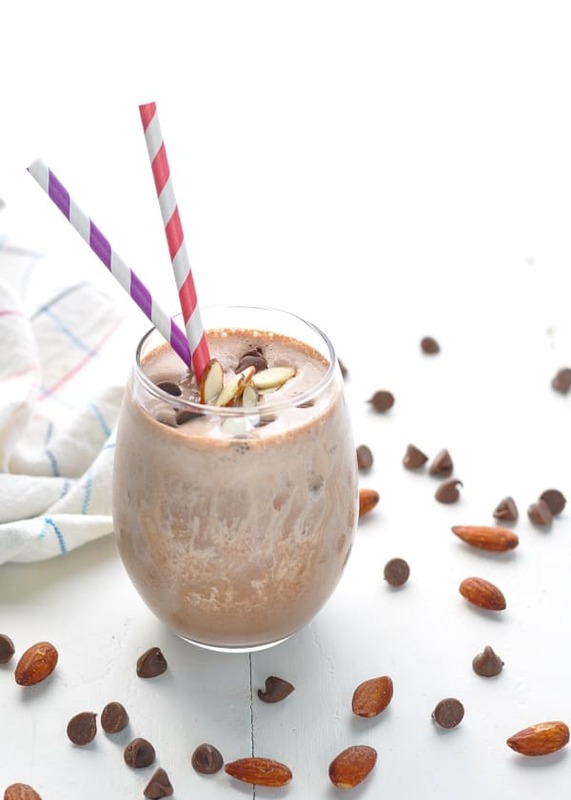 Combine all ingredients in a high-speed blender. 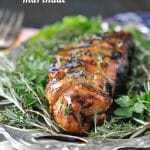 Pour into a serving glass and garnish with optional toppings. Serve immediately. This yields one very large smoothie, or two smaller smoothies. 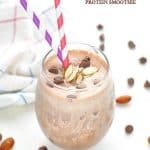 The protein powder will help to thicken the smoothie and increase the protein, but it is not necessary. The nutrition facts do NOT include protein powder. 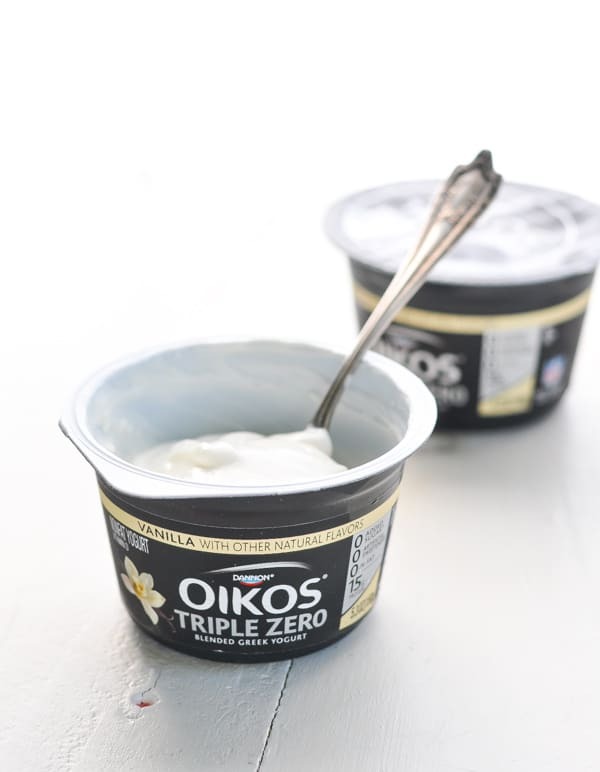 This is a sponsored conversation written by me on behalf of Oikos, Danimals, and Light & Fit. The opinions and text are all mine.